When I posted my orange lampshade DIY a few of you asked about that little rock box that was on the table. So happy its Thirsty Thursday, I really could use a cocktail right about now (see here to know why). PS. I need a cocktail today too! Is it 5 yet? cute DIY! - i already got my cocktail list in my head - going out which is PERFECT! Could you be any more clever and handy?! And I'll bet with a little paint that ugly table might not have to go!! very cute! It definitely adds a nice color to the table. Not to worry, we all have "ugly brown side tables" in our lives (or something like them). At least you have such a good eye for decorating them well and covering it up!! 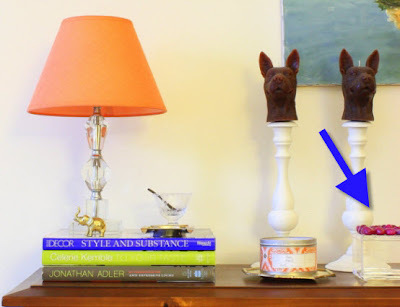 What a great DYI project - really makes a nice addition to the table! I LOVE this! Where did you find the cute lucite box?? DO tell, where did you happen to find the lucite box? What did you use to adhere the stones, epoxy? Love it!! You're so creative - I am definitely going to be stealing this idea!! OMG, another box! I love it! And it's soooo much less expensive but just as cute as the original. i sent those rock boxes to my mom saying we need to do a DIY version! haha. nice job! You only need *a* cocktail??? (c: I just keep asking "is it the weekend yet???" How whiney am I??? (c: That box is so stinkin' cool...the wheels in my head are already turning! 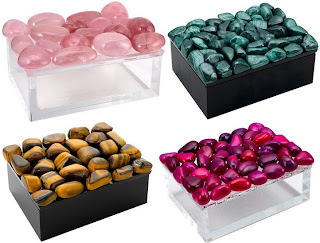 Nice - I love that you used a lucite box with the pink. You always come up with the best DIY ideas! You and all of your many boxes...oh and trays etc. What a great job you have done again. I too want to know where you found the acrylic box. Hi everyone- so sorry I didnt put this in my post, but the box came from my favorite place, The Container Store! This post... Rocks! :p XoXo!